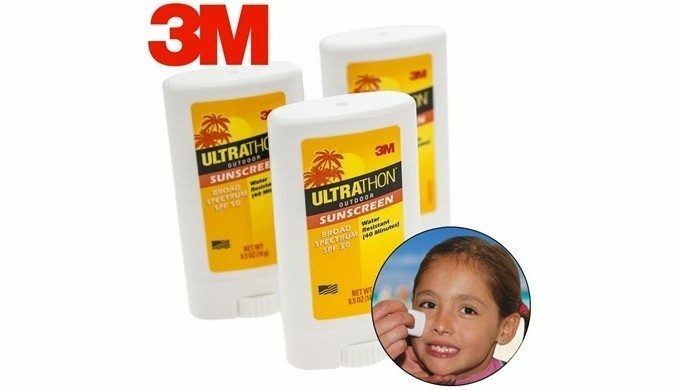 Ultrathon 3M Sunscreen Face Sticks - 3 Pack Only $6 Plus FREE Shipping! You are here: Home / Great Deals / Ultrathon 3M Sunscreen Face Sticks – 3 Pack Only $6 Plus FREE Shipping! Ultrathon 3M Sunscreen Face Sticks – 3 Pack Only $6 Plus FREE Shipping! When the sun finally arrives the kids will want to be out there 24/7. Make sure they are protected with this application easy sunscreen. The Ultrathon 3M Sunscreen Face Sticks – 3 Pack Only $6 Plus FREE Shipping is designed to provide a broad spectrum Sun Protection Factor (50). The three sticks included here are super compact, so you can slip one in your pocket, purse, bike or travel bag!